“Maria’s Ride” aims to raise $300K to purchase driving simulators teaching young people how to become safe drivers. EL DORADO HILLS, CA, USA, July 11, 2018 /EINPresswire.com/ -- Virtual Driver Interactive, Inc. (VDI), the leading provider of simulation training solutions, today announced that the Maria Tiberi Foundation is having “Maria’s Ride” event on September 16, 2018 at 8:00 am. A procession of 300 cars will begin at Dublin Coffman High School and end at the Schottenstein Center on The Ohio State University campus. The event will raise money for advanced driving simulators to eradicate the epidemic of teen driving injuries. “Maria’s Ride” was created to raise at least $300K in donations to go towards a curriculum and simulators to fight against distracted driving. Every dollar raised will go to The Maria Tiberi Foundation to purchase distracted driving simulators. There are several ways to take part in Maria's Ride: participants have the choice to be a driver, virtual driver, join or start a team or simply donate. To learn more, go to Maria’s Ride. Dom & Terri Tiberi founded the Maria Tiberi Foundation in memory of their daughter, Maria, who was killed tragically in an automobile accident. The Tiberi’s are devoted to ensuring no one else has to endure the tragic loss of a loved one due to inexperience or lack of appropriate driver education. To increase defensive driving skills as well as understand the consequences of distracted driving, Mr. Tiberi recommends that simulation become part of standard driver education in the U.S.
"We as parents and grandparents should be outraged that the number one killer of our kids age 8 to 24 is car crashes…it is so preventable. Education is the key and we must change teen driving behaviors and habits. Distracted driving is an epidemic in our country. It is anything that takes your eyes off the road, your hands off the wheel, or your mind off your driving.” said Mr. Tiberi. “I believe the use of simulators is a great educational tool." 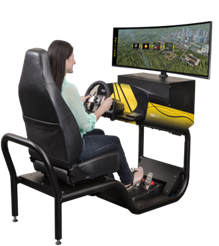 Virtual Driver Interactive (VDI) is well known in the simulation industry for its vision of innovative simulation-based training. VDI offers highly portable, affordable and effective solutions. Titles include One Simple Decision®, a deterrent to distracted or impaired driving and Virtual DE™ (Virtual Driving Essentials), a driver training and assessment program teaching critical skills. VDI is a privately-held company headquartered in El Dorado Hills, California. For more information, please visit www.driverinteractive.com. The Maria Tiberi Foundation is a non-profit 501(c)(3) community-supported organization that encourages defensive driving and educates about the dangers of distracted driving. The foundation is named in memory of Maria Tiberi, the daughter of central Ohio TV sports anchor Dom Tiberi, whose life tragically ended after driving distracted. “Maria’s Message” is dedicated to stopping the epidemic of teen deaths caused by distracted driving car crashes. For more information, please visit http://www.mariatiberifoundation.org.